Audi sold about 1.878 million vehicles globally in 2017, with nearly 227,000 vehicles in the US. The status-symbol manufacturer debuted its first all-electric fast-charging e-tron SUV in San Francisco this week, partnering with Amazon’s Home Services division for home charging stations. The e-tron will come in three models, ranging in price from $74,800 – $86,700, made in Audi’s new Brussels factory in Belgium. Delivery is expected in the middle of 2019. Audi is aiming at the e-space currently held by Tesla with its Model X, which ranges in price from $79,500 for the 75D version to $140,000 for the P100D. Other luxury brands entering the premium e-SUV market next year are Mercedes-Benz with its $80,000 EQC and Jaguar’s $70,495 I-Pace. My how the times have changed: my first house in Milwaukee, Wisconsin was $76,500 in 1992! 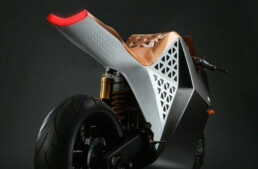 As we reported recently about Audi’s motorcycle brand Ducati, e-bikes are making strides in performance, style and accessibility. So when an automotive juggernaut like Audi goes big with its e-tron, will the two-wheel engineers in Bologna follow suit? The e-tron’s battery system is located beneath the cabin, measuring 90” L x 63.6” W x 13.4” H. Thirty-six cell modules are housed in shoe-box-sized square aluminum boxes. They are arranged on two levels, known as “floors” – a longer lower floor and a shorter upper one. At market launch, each module is equipped with 12 pouch cells having a flexible outer skin of aluminum-coated polymer. The battery operates with a nominal voltage of 396 volts and stores 95 kWh of energy. A cooling system of flat aluminum extruded sections – divided uniformly into small chambers – has the task of maintaining the battery’s high-performance operation over the long term. Heat is exchanged between the cells and the cooling system beneath them via a thermally conductive gel pressed beneath each cell module. In what is a particularly resourceful solution, the gel evenly transfers the waste heat to the coolant via the battery housing. The weight of the battery system including the housing pan with intricate crash structures is roughly 1,543.2 pounds, bolted to the underbody at 35 points. This increases the torsional rigidity of the body, which in turn integrates numerous aluminum parts such as the floor plate in the rear structure, the doors, as well as the hood and tailgate. The cabin features components made from heat-formed, ultra-high-strength steel. The e-tron is engineered for both AC and DC charging via the widespread SAE J1772 and Combined Charging System (CCS) standards. 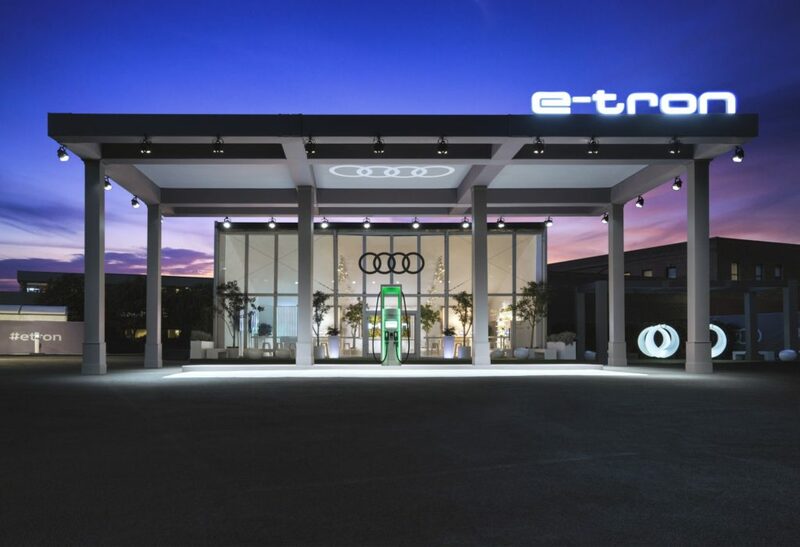 In an industry first to date, the e-tron debuts a DC fast-charging capability of up to 150 kW available at select high-speed public charging stations, this capability can deliver up to an 80 percent charge in only approximately 30 minutes. For customers’ residential charging needs, a standard 9.6 kW AC capsule charger (Level 2, 240-volt/40 amps) is provided and designed to deliver a fresh charge overnight. This charger will include plugs that can use both a standard 120-volt household outlet (1.2 kW) as well as a fast-speed 240-volt NEMA 14-50 outlet (9.6 kW). In addition to standard automotive aerodynamics, the e-tron’s standard-equipped heat pump uses the waste heat from the electrical components. Up to 3 kW of the actual power loss is used for cabin heating and air conditioning as well as cooling the electric motor. Depending on ambient temperature, the heat pump’s design can contribute to the Audi e-tron range by up to 10 percent. Highly flexible thermal management also allows fast direct-current charging to help maintain a long battery operating life and repeatable road performance. Two electric motors accelerate the e-tron from 0-60 mph in 5.5 seconds, reaching a top speed of 124 mph. Maximum drive torque is reached in 250 milliseconds! God bless electronic drivetrains. Two asynchronous motors are designed to keep the temperature level low. Single-stage transmissions transfer the torque to the axles via the differentials, and each motor is supplied by power electronics that act in close consort with the powertrain control unit. According to Audi, when the e-tron is traveling at moderate speeds, it’s powered mainly by the rear motor. When coasting, the motors operate free from magnetic drag torque – another strength of ASM technology. The e-tron uses an innovative recuperation system using both electric motors to boost efficiency. 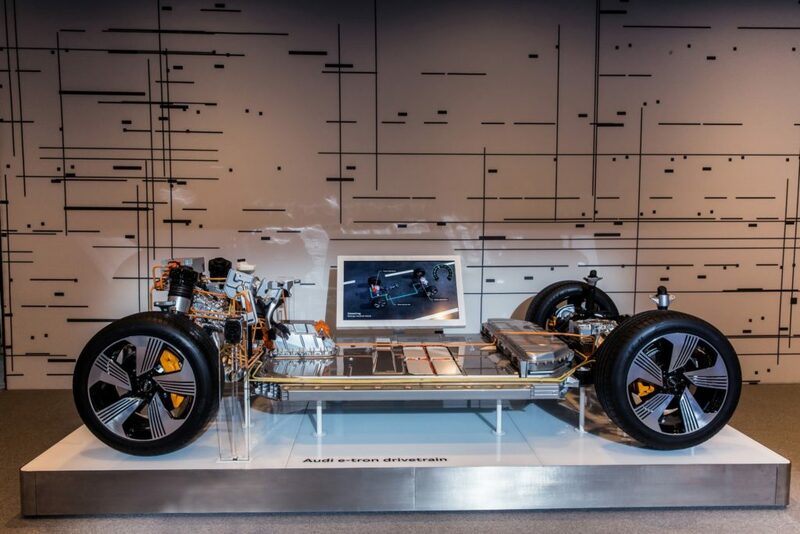 On average, Audi engineers estimate that this system is responsible for as much as 30 percent of the e-tron’s range depending on the conditions, terrain and driving style. The electric SUV can recover energy in two ways: by means of coasting recuperation when the driver releases the accelerator, or by means of braking recuperation by depressing the brake pedal. When pressing the brake pedal, the electronic control unit computes within milliseconds how much pressure the system needs to build up for the specific braking process required. A high-performance electric motor supplies the necessary energy. The integrated brake control system is approximately 30 percent lighter than a conventional system thanks to its more compact design. As a result, the conventional vacuum pump is no longer needed in this configuration. Additionally, the brake control system decides whether to use the electric motors as alternators or to use the friction brakes – all without the driver noticing. Up to 0.3 g, the Audi e-tron is decelerated solely by the electric motors – that covers over 90 percent of braking scenarios. So energy is returned to the battery in practically all normal braking instances. Above this deceleration value, for example in a full brake application, the friction brakes come into play. Thanks to a newly-designed, electro-hydraulic activation principle, they are particularly quick to respond. The driver can select the degree of energy recovery in three stages by means of paddles on the steering wheel. In the lowest setting, the Audi e-tron glides with no additional braking torque. At the highest stage the electric SUV is slowed more noticeably – the driver can slow down and accelerate solely via the acceleration pedal, if desired. This creates what is referred to as a `one-pedal’ feeling. The myAudi app can be used to plan, control, and monitor the charging and pre-heating/-cooling of the e-tron. Customers can set a departure time, for example, so that the vehicle is charged and/or heated/cooled at the desired time. Customers can even choose to heat or cool certain zones in the car. On cold winter days, for example, customers can turn on the optional seat heating. The app also displays charging and driving data. 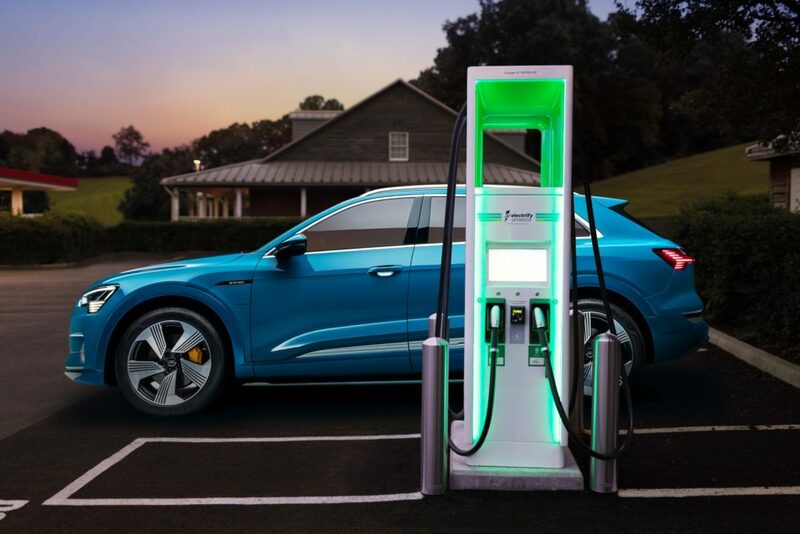 With the purchase of the Audi e-tron customers will receive 1,000 kWh of charging at Electrify America sites over four years of ownership. Amazon’s voice-activated ‘Alexa’ software has been fully integrated into the e-tron’s MMI system and is on board for customers to access many of the same features and services in the vehicle as they can in their home or through other Alexa-enabled devices. You can check news, weather and sports scores, order groceries and add things to your to-do list, stream music and audiobooks via Audible, Amazon Music and TuneIn. With smart home controls, you can lock the doors, turn off the lights, and close the garage door directly from the vehicle – all you have to do is ask. 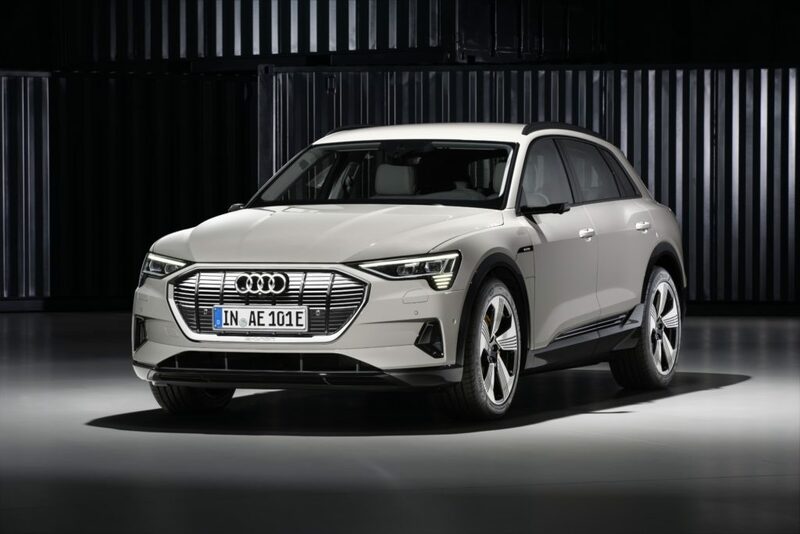 Audi e-tron customers are now able to configure and reserve their vehicle with a fully refundable $1,000 reservation fee ahead of delivery in mid 2019. Audi’s 303 US dealers provide a much wider ecosystem compared to Tesla, and coupled with Mercedes and Jaguar entering the premium all-electric SUV arena, it will be interesting to see how Elon Musk handles the newly-crowded space. Like to place odds like every other EV currently sold in the US that Audi’s e-tron will languish on dealers lots collecting dust until they’re practically given away at less than econobox bargain basement prices ? Should you chose to accept such a wager …. you lost before you ever so much as considered it .. because the simple fact is … the only vehicles that are currently selling at a reasonable rate ( as well as a decent profit ) in the US are ..